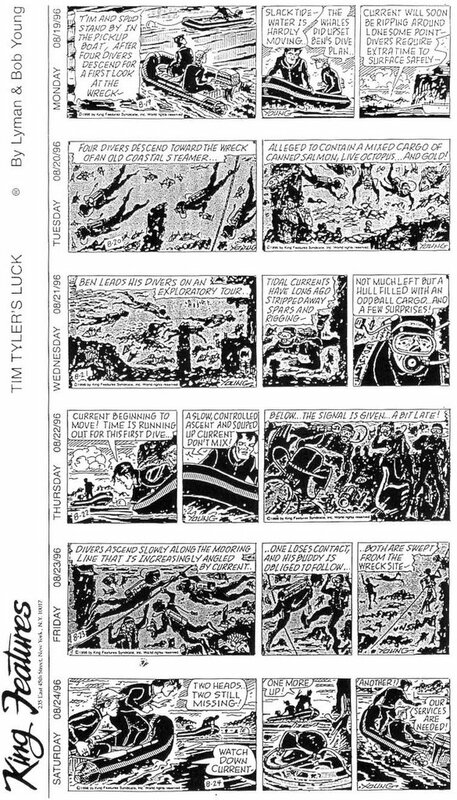 Tim Tyler's Luck, created in 1928 by Lyman Young, was a popular feature in the 1930s. By the mid-40s papers were dropping it, and by the 60s it was rarely seen. Amazingly, though, it continued in syndication until 1996! 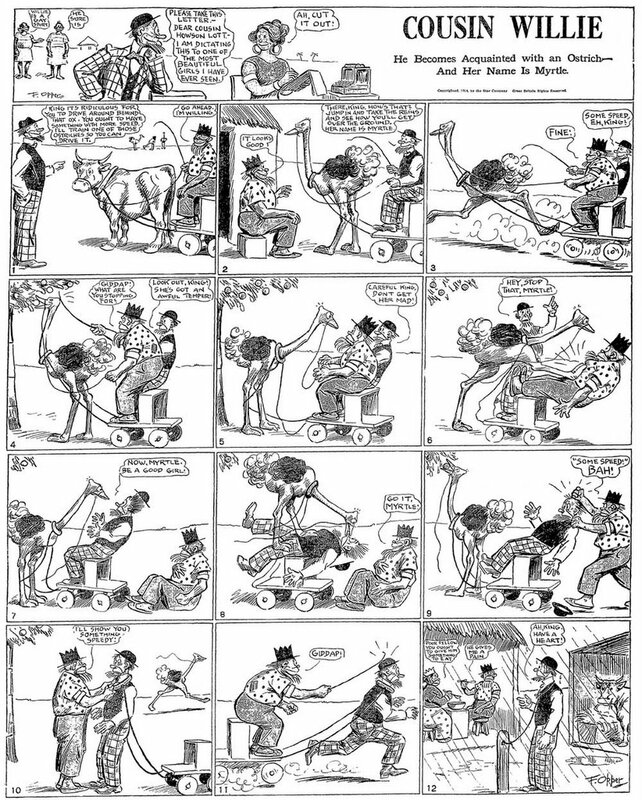 According to rumor the strip ran in no U.S. newspapers for at least the last decade of its existence. I no longer recall where I heard this, but the rumor was that the strip continued for so long for two reasons. First, Lyman Young was Chic Young's brother, and King Features didn't want to offend cash-cow Blondie creator Chic by dumping his brother. Second was that supposedly the strip was still propular in some foreign markets, making it (barely) profitable enough to continue production. I tend to favor reason #1 over #2 if only because the strip was really pretty bad by the 1980s and I can't imagine any paper, foreign or not, being all that hep to run the thing. Well, judge for yourself with the last week of the strip. Also notice the sad fact that after being in syndication for almost 70 years, the strip wasn't brought to any sort of conclusion. We end up in mid-story. Anyone know what the name of the TX paper is? Two recent book released definitely deserve a place on your 'to read' pile. 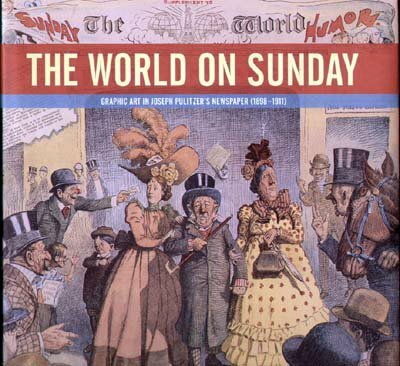 First is The World On Sunday (ISBN 0-8212-6193-2) by Nicholson Baker and Margaret Brentano. Baker is the author of Double Fold, a scathing indictment of library practices, mostly as they relate to the disgraceful dumping of newspaper bound volumes. While Baker was putting together his book, he discovered that perhaps the last remaining set of bound volumes of the New York World was to be disposed by the British Library. Somehow he scraped together enough money to purchase the set (along with many other newspaper bound volumes) and had them shipped to the U.S. He initially planned to keep them in storage himself, and actually did so for a few years, but finally had to make a deal with the devil, and handed them over to Duke University. We can only hope that he made Duke sign a contract in blood not to dump these priceless volumes the next time they feel the need for a bit of storage space. This coffee-table book is the result of Baker taking high quality photos of some of the more spectacular pages of the New York World before he gave them up. And oh my they are spectacular. The World's Sunday editions of the 1890s and 1900s are filled with the most wonderful color artwork, some of it really does take your breath away. I've been lucky enough to see some of these spectacular comic and magazine sections, mostly in the incredible collection of the late Gordon Campbell (what happened to his collection after he died?). I know how wonderful this material is, so buying this book was a no-brainer for me. But all I can tell you is that I absolutely promise that you will not be disappointed. Get this book! 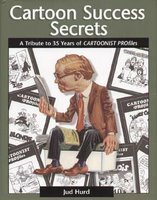 The other book is Cartoon Success Secrets - a Tribute to 35 Years of Cartoonist Profiles (ISBN 0-7407-3809-7) by Jud Hurd. Jud, the editor and publisher of Cartoonist Profiles magazine since its inception in 1969, here brings together some of the most interesting cartoonist interviews and articlees from the 36 year run of the magazine, plus much additional material never before seen. If you've ever read Cartoonist Profiles I don't need to say another word to sell you on this volume; if you haven't, well, take my word for it - it is comic strip fan nirvana. Jud Hurd died earlier this year at the ripe old age of 93 and that brings a probable end to dear old CP magazine. It will be much missed, as will Jud. noting your comment about Duke U needing to sign an oath in blood - I understand your feeling, since some college archives do sell their holdings-- on the other hand, Duke U has the Murray Brothers comic book collection consisting of virtualy all comic books from the 50s-70s (and lots pre and post that dates, like a complete Barks collection), tons of fanzines, 30 year collection of newspaper strips, original art (including Frazetta), I feel sure they knew what they were getting those NY World volume. Problem is that it often isn't the librarians, many of whom have a proper respect for the material, who make decisions to microfilm and dump their holdings; it's the beancounters. And we are to blame, too. Libraries need our financial support, even those associated with government and colleges. Their budgets are often the first line item to get cut when one of those periodic belt-tightenings comes a-callin'. I highly recommend that you read Baker's "Double Fold". It is a real eye-opener. Hello, Allan----The only problem I have with THE WORLD ON SUNDAY is that they are too much into giving the "bound volume experience", that is, a page of interest must show whatever was on the adjacent page as was found in the volume, regardless of how dull and random. [Want ads, real estate, laxative ads] This makes 50% of the book just irrelelevant, when it could have certainly been put to better result. 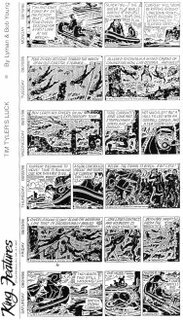 I'd love to see a whole year of early Pulitzer comic sections reproduced, for instance!----Cole Johnson. I agree that for two clipping vets like us the experience isn't all that exciting, but we are among the very few who have been lucky enough to enjoy bound volumes of great newspapers firsthand. I think the book will really blow away the average person. Johnny Gruelle, famed creator of Raggedy Ann, spent a little time working for the World Color Printing Company of St. Louis Missouri. World Color (my favorite syndicate) did preprint Sunday comic sections. If you, a newspaper owner, wanted to add a Sunday color comic section to your paper but couldn't afford to print your own color comics or hire an outside printer to do the job for you, then companies like World Color were your last resort. They printed a standard comic section, added your logo to it and shipped you however many copies you needed. Gruelle (who signed himself Grue during this period) did a number of strips for World Color. The Bud Smith strip was not created by him, but he did a few episodes of it in 1908-09. The strip was created by George Herriman in 1904. 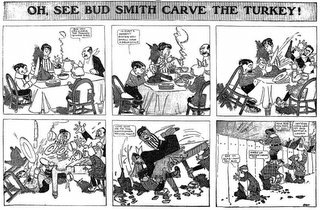 In the period 1909-1914 the incredibly prolific Fred Opper was producing a number of miscellaneous quasi-daily strips, the well-known Happy Hooligan Sunday page, plus the more obscure Sunday strip Howson Lott. Howson Lott ('house on lot') began as a satire of the new trend of the middle-class to move out to the country. Opper ended up using this strip as sort of a catch-all for various characters; Maud the mule showed up on occasion, the King of the Cannibal Islands was a semi-regular (as seen on this sample), even good old Alphonse and Gaston were liable to pop in. By 1914 the title character was often absent as can be seen on this example, which features a regular character named Cousin Willie. Even the title has changed - Opper did this frequently, giving us poor historians fits trying to figure out when the series begins and ends. Note that Opper does a bit of a daring turn here. We see Cousin Willie making eyes at a black girl, and we also see Willie being 'subjugated' by a black man. I'll bet you a dollar that this strip did not run in Southern papers that week! No, it was more often a half-pager. Where was Howson Lott published? In what newspaper(s)? In the Hearst newspapers and their clients. I've just come across a couple of references to a friend living in the Dublin Mountains but working in Dublin City, as "Howson's Lott" in my grandparents' letters from 1911, so either it was in some Dublin (or possibly English) paper or the cartoonist elder brother of my grandmother had introduced them to the cartoons - he was back and forth between the US and Ireland, as were many Irish people at the time (you get the impression that the Celtic, Majestic, etc were the Ryanair of the time). I'm back from my weekend off and I'll start off with a post of pure crass commercialism. I am selling a large collection of 1950s and early 60s Sunday strips on eBay right now. There's a lot of great titles available, including Flash Gordon, Prince Valiant, Hopalong Cassidy, Rusty Riley, Mandrake the Magician and lots more. All lots are pictured (a sample pic accompanies this post). The auctions end soon so don't delay! To check out my eBay auctions click here.